Xephyr is a kdrive server that outputs to a window on a pre-existing “host” X display. In simple words, Xephyr allows you to nest X server within a X server. You can always create a new X server with startx — :1 , but what it actually does is create a new parallel X server in a new tty, which means only one X instance is handled at a time and you need to perform a Control, Alt, and Function combination each time you need to switch between X instances which is quite frustrating and inconvenient. Here is where Xephyr differs. It creates a new instance of X server within the current X server. The new X server behaves like any other application window. You can execute applications, as well as full Desktop sessions in the nested X server. Advantages? Well, it is quite cool! Other than that, you can use it for conveniently testing out different Desktop Environments and window managers without any disruption to the current X session. 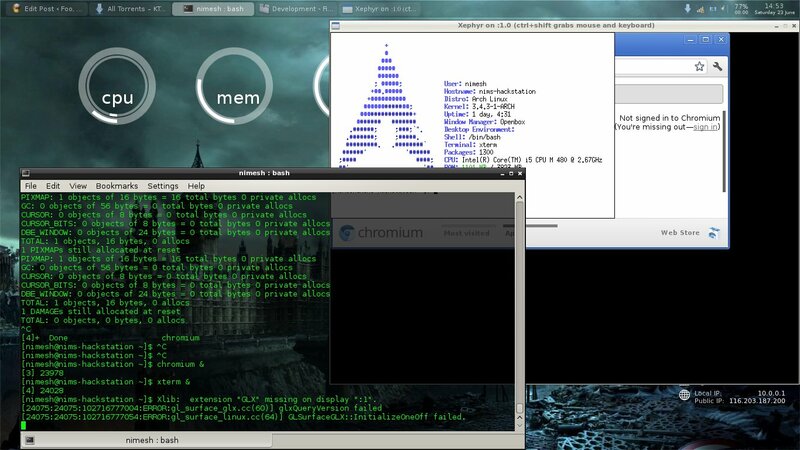 You can also use it to forward X sessions via ssh without VNC. Although you can forward X applications using ssh without anything else, imagine forwarding multiple applications or a whole Desktop session. -screen : sets the resolution of the new X session. Set it according to your need. -reset: Resets the X server when the last X client is closed. The Xephyr should start and you will get a blank new window. The $DISPLAY environment variable tells the X client to which X server it should send its output to. Thus, $DISPLAY controls in which X server an X application pops up. As you must have figured it out, by default, $DISPLAY is set to “:0“. Now, set the $DISPLAY to “:1” so that you can send output to the Xephyr window. Then shoot up any X application and it will get displayed in the new X Server. Time for some cool stuffs. For KDE, dbus-launcher /usr/bin/startkde worked for me. 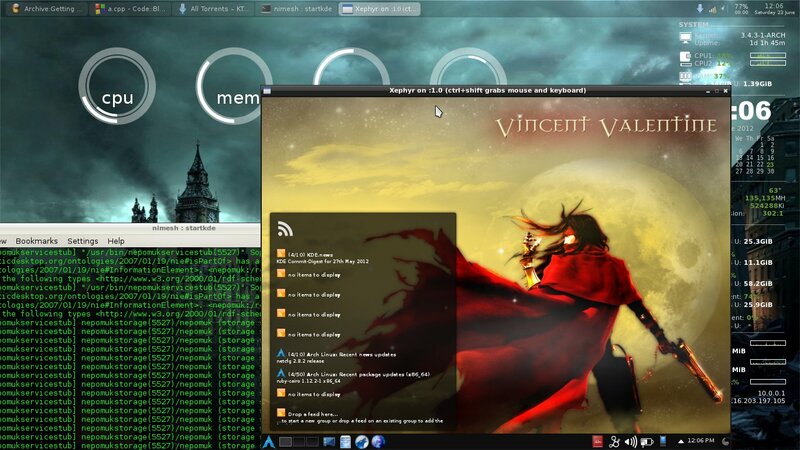 The process is similar and simple for most other Desktop Environments and Window manager. Here is a snapshot of my main openbox session in which an awesome (window manager) session is nested, in which in turn is a nested KDE4 session. One advantage of running nested X sessions using Xephyr is the ease and flexibility of forwarding the new X session. As i said in the first lines of this post, my next aim is to use Xephyr to configure multi-seat using only one graphics card. Will post about it later. Anyways, any corrections, feedback, queries, etc, feel free to comment. btw.what do u mean by nested sessions??????? you start the sshd daemon on a REMOTE “application server”, which is DIFFERENT than the Xephyr server. Then, on the Xephyr machine, you start Xephyr AND open an ssh session to your “app and ssh server” enabling X11 forwarding (which means in fact “forwarding X11 request from the REMOTE ssh server to THE X-server of the local ssh CLIENT, the CLIENT= the machine where we run the ssh command”). Of course, you can work on a very same machine to test other window manager and so on, and then XEPHYR-SERVER=SSH-SERVER=LOCALHOST. In that case the ssh step is useless and replaced by a direct execution of your X-application, but the export DISPLAY is still necessary.